A close, loving relationship with your little one is critically important for his or her wellbeing and development. Most of us take this for granted and feel our love comes naturally, but do we know why it is so important? That close loving relationship between mum or dad and their little one is called ‘bonding’ or ‘attachment’ and scientific research shows that not only is it critical for baby’s physical and emotional health, it is also critical for his or her brain development. The first few years of a child’s life set the path for her development and success. The early years are the time when the brain is developing at lightning speed, so it provides a unique window of opportunity to give your child the best possible start in life and ensure he has the best opportunity for social, emotional, cognitive (or intellectual) and physical development. So what happens when that loving caring relationship with baby is not present? Research shows that babies who do not experience close, loving relationships often fail to develop normally. They often fail to develop a strong sense of self, the ability to form good relationships throughout life AND they struggle to learn. Every experience your young child has, dictates how his or her brain is wired. Each stimulus – each kiss, each word, each smile, each story, each sunset – promotes the development of brain cells or neurons and their connections. So what does this mean for parents and caregivers? The good news is that many of the things you do naturally out of your love for your precious little ones is all the ordinary magic needed. It’s your LOVE, PLAY, TALK – the way you cuddle, smile and talk to your baby when you feed her; the way you quickly respond to your baby crying; the way you chat and tell your baby what you’re doing when you change his nappy or dress her; and all the things you point out to him and tell him about when you go for a walk together. A happy baby has the best chance of growing up a happy, well-adjusted adult! Learn more about what you can do to change your child’s future by listening weekly to LOVE, PLAY TALK, the radio programme on Valley FM aired EVERY Tuesday from 10 to 10.30am and brought to you by Ilifa Labantwana and RCL FOODS. Each week Valley FM hosts a guest speaker to deal with a different topic to support you, the parent of a young child, give your child the best start in life. You, the parent, have a critically important role to play! 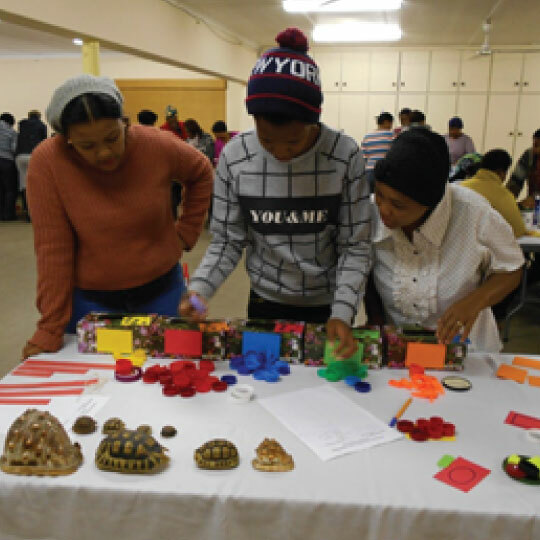 RCL FOODS sponsors FCW, the Foundation for Community Work, to facilitate the Wordworks ‘Every Word Counts’ early literacy and numeracy programme, and then support implementation in ECD programmes at centres and in home visiting programmes. Last workshop everyone had such fun experiencing what children learn through play! Participants themselves played with sand and water and really understood how this is the beginning of scientific thinking. They sorted, measured, counted and played with shapes – the beginning of mathematics! They played with listening, sounds and story-telling – the start of literacy and learning to read and write. Now we hope to see them giving their young children these exciting opportunities to learn through play.